Online Sequencer Forums - Frequently Asked Questions. Online Sequencer Forums > Online Sequencer > News > Frequently Asked Questions. Full Version: Frequently Asked Questions. Note: All questions here will be answered in the quickest, and probably most sarcastic way possible. I'm tired of having newcomers ask the same things on this site. The list will change accordingly. If you got anymore questions, just ask them here on this thread. Q: How do you change the note length so that it is greater than a 1/2 note? Please note that doing this will not affect the actual sound length of the note in the sequencer, and is only useful for exporting as MIDI. Please also note that this is an old tutorial, and while it still works, you do not have to look for the "Experiments" tab in order to change the lengths of notes. Q: How do you change your profile picture? Q: Where can I see my sequences that I've created? Replace the "####" with your User ID number. There are two ways of finding this number out, one is to click your name where it says at the top right, "Welcome back <username>!" You should be redirected to a link similar to the one above. The last four numbers of that link is your User ID. The second method is to click on your name on a comment while you are in the "Chat" menu. You should be redirected to a link similar to https://onlinesequencer.net/forum/member...rofile&uid=#### The last four numbers of that link is your User ID. Q: How do you delete your sequences? A: Look for the button that says "Delete" on the published sequence. Q: Why is this site terrible? A: Try pressing Ctrl+W and see if that helps. What keys on the keyboard translate to black keys(Sharps/minors)? (04-25-2017, 01:58 PM)Blackkeys Wrote: [ -> ] What keys on the keyboard translate to black keys(Sharps/minors)? You meant the typing keyboard, right? The mapping of keyboard keys to notes depends on the selected musical key (use the menu at the bottom). If you don't pick a key than it will default to C Major which obviously doesn't have any black keys. 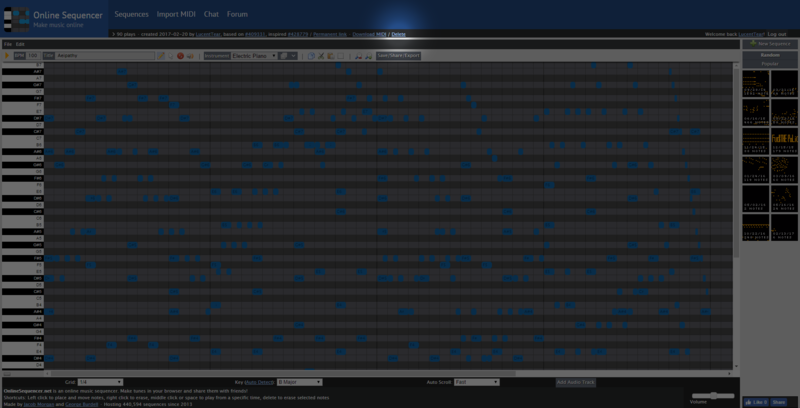 Why does this site get sooo laggy even when I don't even have 10 measures filled in yet? I love the last question/answer! How can I export my music better? (02-10-2019, 08:55 AM)Animus Wrote: [ -> ] How can I export my music better? I made a tool once, but it doesn't count reverb nor delay. It's technically illegal though because the soundfonts OS uses are mostly copyrighted.